The Tiger Fire Pit is one heavy duty fire pit. And It's Made in Weatherford, Texas by American citizens. My name is Jim Jarvis and I own Dancing Fire Inc. along with my wife Julie. THE TIGER FIRE PIT is in my opinion the best designed and manufactured tank fire pit we've seen. It's built like a TANK. Should last multiple life times. American made Stainless Steel spark safety screen that we manufacture. It's very practical in the design. Scroll through the "View more images" link under the pic above. You will notice the screen, and as you scroll through you will see a built in firewood grate and a grill that's 75% full coverage. What this is is just that a Grill you can cook on if YOU CHOOSE to use the pit as a grill. And it makes a wonderful firewood grate. 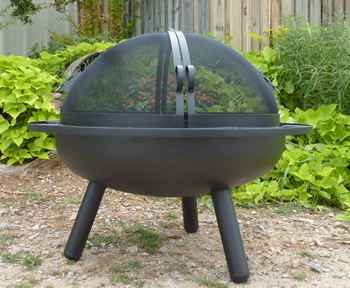 This is a fire pit first but it doubles as a very well designed grill. This is not a Grill that works as a fire pit. Big difference. and they swing out here and there and they don't go away, they are part of the fire pit. They get greasy and dirty. But what if all you want to do is sit around the pit and have a drink and chill? You still have all these greasy things swung out here or hanging there. Not quite the show piece at the party anymore with grease and such all over it. Once it's greasy and dirty it will probably stay that way. If you don't desire to grill on your fire pit this is fine as the grill is optional. But you can if you ever want to without a large investment. The grill rotates effortlessly to move around the food for cooking different foods at the same time. The grill is made of 3/4" solid heat treated rods with 1/2" expanded metal on top of that. The Tiger comes in different sizes and numerous options. The sizes are 48", 42", 36< and 28". The height can vary but most are 18" tall. The Tiger can come to you as a plain bowl with legs are fully loaded as shown. We start with a basic pit with legs. Then you have the "Boot strap" that goes around the opening that extends out about 6" so a 48" fire pit with boot strap is actually 60" in diameter. This is convenient as the shelf gives you a place to sit a beverage or something. Then you have the choice of a built in grill and firewood grate or we sell a firewood grate that's a one size fits all grate and it's a free standing firewood grate. It's pictured below top left image.